It’s beginning to look a lot like Christmas!! I don’t know about where you are, but we are going to have a white Christmas here in Calgary. The stockings are hung, the meals are planned, the gifts are wrapped, and the little ones are busting at the seems trying to contain their excitement!! Whew! That was A LOT to take on! Hopefully this holiday season you will find some time to slow down, put your feet up and relax. There are many benefits to relaxation, but did you know that it’s imperative for proper digestion of your food? So many of us eat on the run. The same number of us deal with chronic digestive problems like gas, bloating and cramping. When we are running around, getting up and down out of our seat at the dinner table and rushing to get the meal done, the nervous system is in a sympathetic state. Our body is primed and ready for fight or flight. In this state, blood is shunted away from the organs to the extremities to prepare the body for defense. Digestion is NOT a priority! When we sit quietly, in a relaxed state and enjoy a meal the body can focus on getting the most out of the food you eat. The stomach produces digestive juices, the liver, gallbladder, intestine and pancreas can release the bile and enzymes needed to break down the food necessary to sustain us properly. What are some things we can do, not just during the holidays (I do find it much harder at this time of year though) but at all meals throughout the year to help with digestion? Chew your food. This seems obvious, but I see my children, friends and family shove HUGE bites into their mouths to rush eating their meals. This is NOT optimal and really hampers the digestive process. You have teeth for a reason. When you chew, your mouth releases saliva that starts the digestive process with the enzymes it contains. Chewing is also a signal to your stomach and intestines that food is coming so your digestive organs start to prepare with digestive juices and enzymes of their own. Chewing also signals peristalsis of your colon to move past meals along to make room for more. Slow Down. Beyond just chewing your food you still need to slow down. It takes time for your body to recognize it’s full and satisfied. If you are rushing through your meals, you may be over full before the stomach signals the brain to stop the hunger sensation. 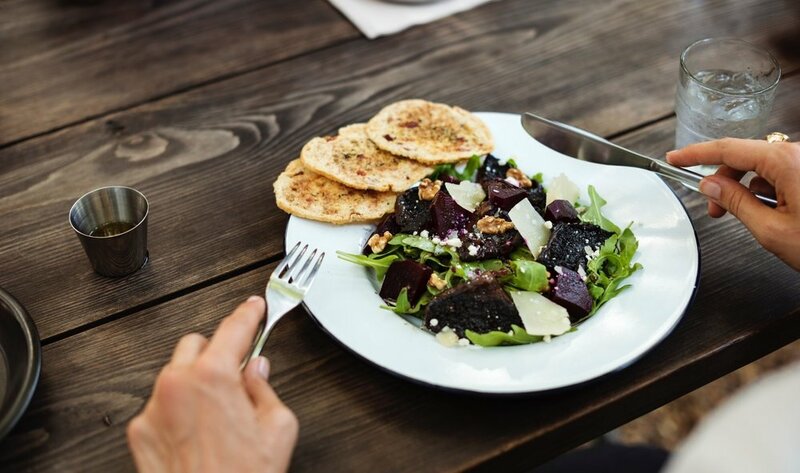 A great idea is to set your fork down between bites to pace yourself. Stay still and seated. I think this is the hardest one in our house. I feel like everyone is always popping up and down to grab one thing or another. I have been trying to make sure everything we could possibly need is on the table like the sea salt and pepper, a drink for each of us, any extra dressing or sauce that may be needed, etc. Like I said, this one is difficult but ideally when you are eating your meals, you are seated, relaxed and focusing on chewing. Turn off the TV. Being aware of what and how much you are putting in your mouth seems like a recurring theme this holiday. That’s because its important! When the television is on or we are overly distracted we are not listening to the signals our body is sending to stop eating. When we over fill our stomach and intestinal system we may feel the effects as digestive upset later. Don’t drink and eat. I’m not saying don’t have a drink at the dinner table. What I’m saying is try not to gulp water, or any fluids, right before or right after a meal. This practice can dilute the digestive juices of your stomach and make your body work much harder to breakdown food for use in the body. Does this resonate with you? Are you constantly eating on the run? Do you have trouble getting your family to sit for supper? Let me know if you have any tips and tricks to share as I would love to have more ideas!! Thanks for reading today and good luck listening to your body for digestive cues as you slow down this holiday season!